Rafael Benitez said he "admires" Liverpool forward Raheem Sterling at the news conference to confirm his appointment as Real Madrid manager. The ex-Liverpool manager has ended a two-year stint with Napoli, signing a three-year contract at the Bernabeu with the promise of "quality football" which "wins trophies". When asked about 20-year-old England international Sterling, Benitez said: "We admire Raheem, that's no secret - but he is not one of our players so I can't really comment on him." "Assuming David De Gea is signed, which most people in Spain are now regarding as inevitable, Benitez has a stark choice to make: stick with Iker Casillas, or install the new arrival straight away?" So, does that mean big-name players could be leaving Real? Not necessarily - despite world-record signing Gareth Bale, 25, being linked with a move back to the Premier League. Madrid-born Benitez, who said he is "emotional to be back home", says he wants to "enjoy" his "great squad" and would not be drawn on contract negotiations. He also batted away a question about the club signing Manchester United's 24-year-old Spanish goalkeeper David De Gea, who could leave Old Trafford this summer. Rafa's happy to be back, though? He has taken all of his backroom team with him as he tries to dethrone Barcelona as La Liga champions and improve on last season's Champions League semi-final exit. He plans to build "an attacking team", built on the foundations of training sessions which are split 80-20 in favour of ball-work to other physical training. Are Real happy to have him? The 55-year-old, who replaces La Decima-wining coach Carlo Ancelotti, was described as "a methodical tactician, tireless worker and footballing scholar" on the official Real website. The article added: "Benitez is one of the greatest coaches on the global stage." 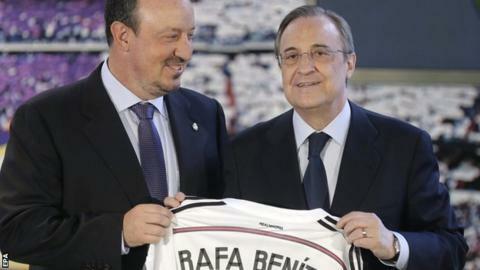 Real president Florentino Perez added that Benitez is "a man who breathes football, professionalism and the very ethos of our club". Mr 8%: What now for Rafa and Real? Read more on Rafael Benitez: Will he be a success at Real Madrid?